The American Express My WishList promotion started up again today (Dec. 1) and the big news is that Amazon.com is back in the fold for 2008. For those of you not familiar with this holiday tradition, the Amex My WishList gives you the chance to “win” free discount coupons for various retailers and purchase numerous high value items for less than their normal price. Usually, it’s all but impossible to get the really the big ticket items, (the cars, for example, are gone before you can blink), but if you’re clicker finger is pretty good you can usually score a coupon or two. As I already mentioned, this year the Amazon.com 25% off Wish Certificate is back and that, in and of itself, makes this promotion worthwhile*. Here’s the official Fatwallet thread which usually ends up getting a lot of responses during the life of the contest. Usually somebody also sets up a Google Group for trading coupons, but I haven’t seen one pop up yet. 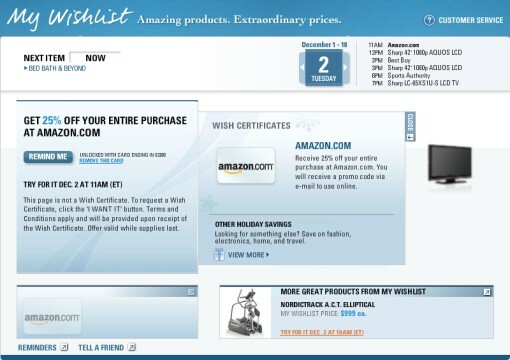 * Amazon.com Wish Certificate offer expires January 15, 2009. Maximum savings amount not to exceed $125. Limit one offer per Cardmember.